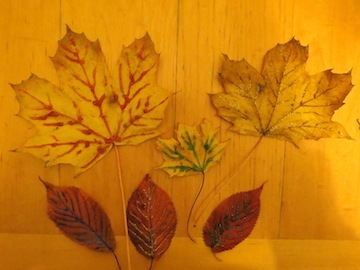 Welcome to our site which full of easy fall crafts for kids to make using autumnal leaves. 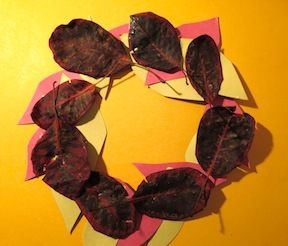 They include how to print with leaves, ideas for decorating leaves with glitter, and instructions for making an autumnal wreath. 1. Take one of your leaves and spread a light coat of paint across the back of the leaf, making sure you spread right to the edges. 2. 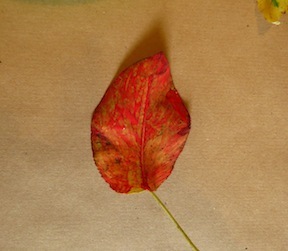 Turn the leaf over and press it firmly down onto the paper. Carefully lift it off and you have your first print! 4. 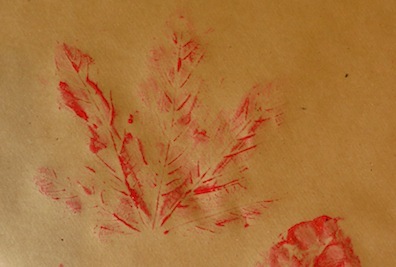 You can also try and use the leaves to make stencils. 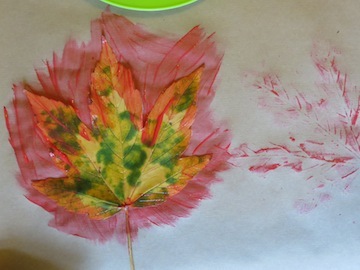 Simply place a leaf onto the paper. 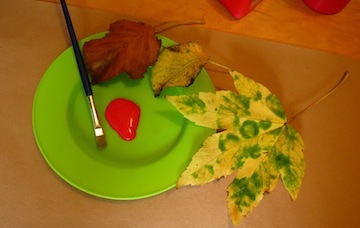 (You could fix it there with blu-tak if your child is young and not able to hold it still while they paint) and paint over the top of the leaf and around the edges. 5. 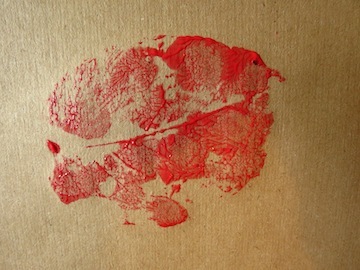 Remove the leaf and you are left with the outline of the leaf that was protected from the paint. Beautiful! 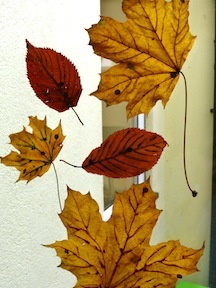 This idea uses leaves and popsicle sticks and is a great autumn leaf craft to try. It doesn't take long to make and looks lovely. You can hang it in the window or somewhere in the house and enjoy those fall colours. Go for a walk and collect, kick and play with all the leaves you find! A handful of pretty autumnal leaves. They can be all the same, or a variety of leaves. 1. 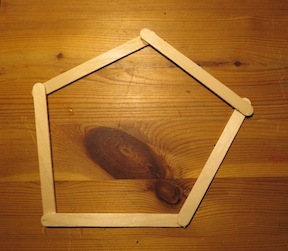 Make a hexagon with the popsicle stick, glueing the ends together with UHU (adults need to help as this is not glue to play around with) or strong PVA glue. Let it dry thoroughly. 2. 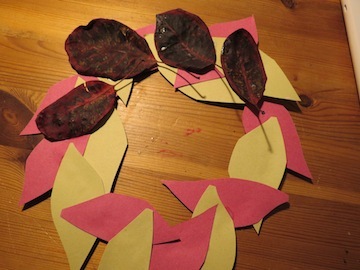 With a younger child help them by cutting out 10-25 leaf shapes out of your autumnal paper. Older children will enjoy doing this themselves. Glue them overlapping with PVA onto your popsicle stick frame. 3. 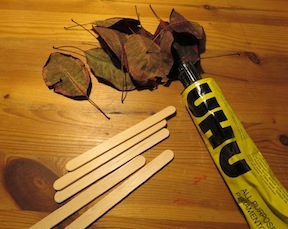 Stick your autumn leaves on top of your paper leaves using enough glue to make sure they stick well. Let everything dry well. Enjoy hanging them up to decorate your home! 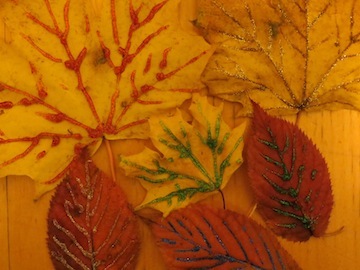 This is another easy fall craft for kids that uses leaves from the yard and adds some autumnal sparkle! 1. Gather your leaves and your glitter glues! 2. Give you kids a selection of different coloured glitter glue pens. 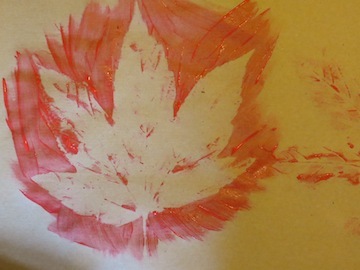 Get them to trace out the veins on the leaves with glitter glue. 3. Leave them to dry thoroughly. 4. 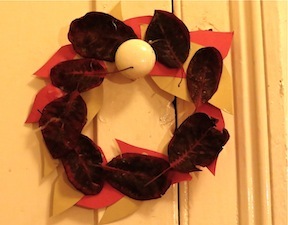 You can stick the decorated leaves in your windows with blue-tak, or stick them on card stock and frame them! 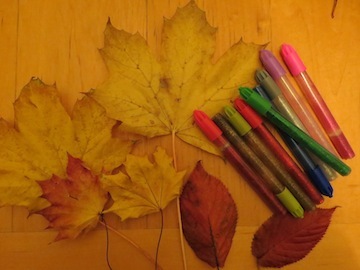 Looking for more fall crafts for kids? 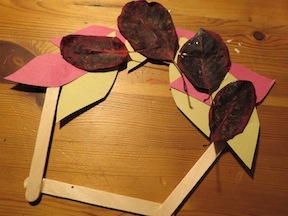 Why not check out our fall craft pattern and instructions for decorating a robin red-breast with autumn leaves.